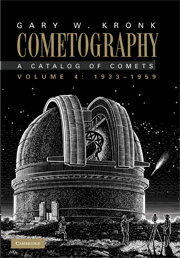 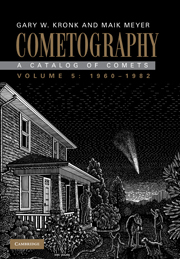 Cometography is a multi-volume catalogue of every comet observed throughout history. 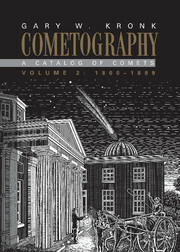 The volumes use the most reliable orbits known to determine the distances from the Earth and Sun at the time a comet was discovered and last observed, as well as the largest and smallest angular distance to the Sun, most northerly and southerly declination, closest distance to the Earth, and other details to enable the reader to understand the physical appearance of each well-observed comet. 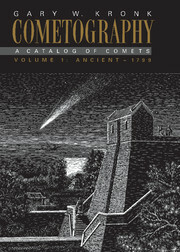 The volumes also provide non-technical details to help the reader better appreciate how a comet may have influenced various cultures at the time of its appearance. 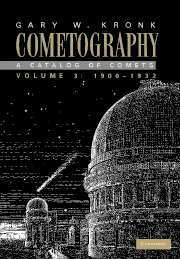 Cometography will be valuable to historians of science as well as providing amateur and professional astronomers with a definitive reference on comets through the ages. 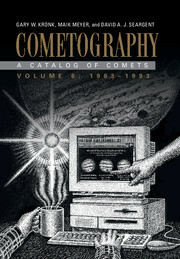 Receive email alerts on new books, offers and news in Cometography.